This video also walks you through configuring both SMTP and IMAP. 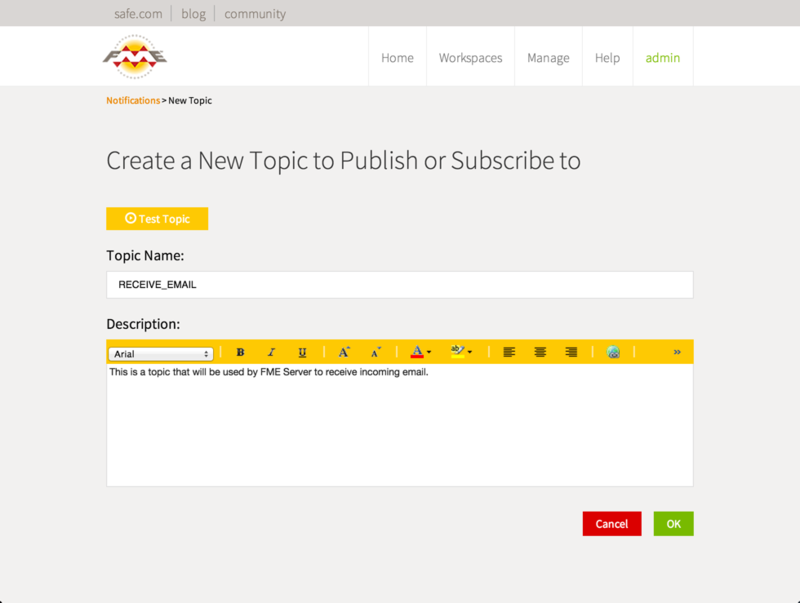 FME Server can be set up to receive emails, and publish them to a topic. The first step is to set up a topic. Since a topic is just a named “channel,” all this involves is giving the topic a name and description. Next, we create the email publication. There are two methods for receiving emails with FME Server. The one method is direct email - FME's built-in email server handles incoming emails sent directly to the host. The other method is to check an IMAP account for new email periodically. IMAP is typically easier to set up, but does require an external email account. This means that when FME Server receives an email sent to a specific email address, it will publish a notification to the topic we’ve created. 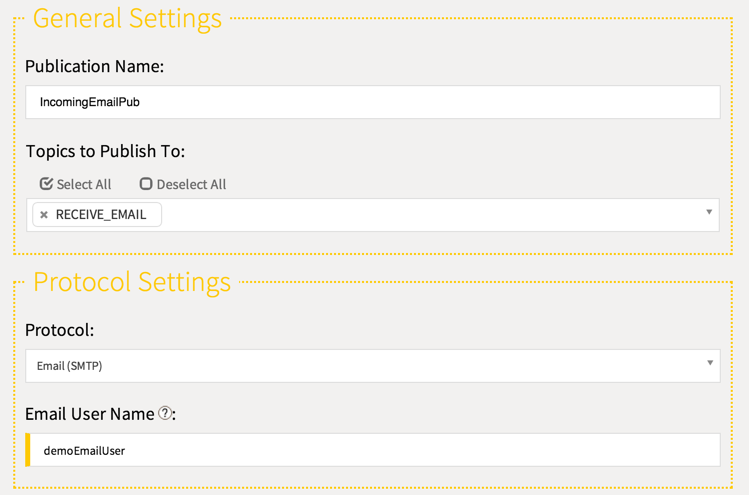 The email address is created simply by entering it in the Email User Name field. Protocol: we will be choosing “Email (SMTP)"
This requires that you have IMAP access to an account for FME Server on an external mail server. We will use Gmail in this example. Protocol: we will be choosing “Email (IMAP)"
To process emails for different purposes coming to the same address, you can enter a subject filter. If it is set, only emails with a subject containing the filter text will result in a notification. To ensure this configuration is working, send an email to the appropriate email account. If you are using IMAP, this will be the account on your mail server (fmeserver@gmail.com in the example above). If you are using SMTP, this will be demoEmailUser@yourFMEServer. 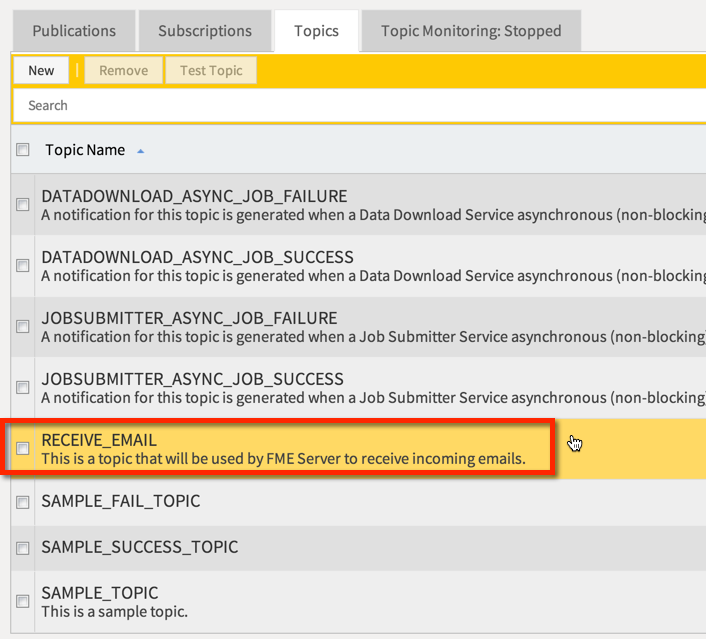 In this section of the tutorial “Receiving email,” we have set up an email topic and publication, which will allow FME Server to receive emails and take action as a result, through subscriptions to the topic. Read on to find out how to create a workspace which responds to emails.